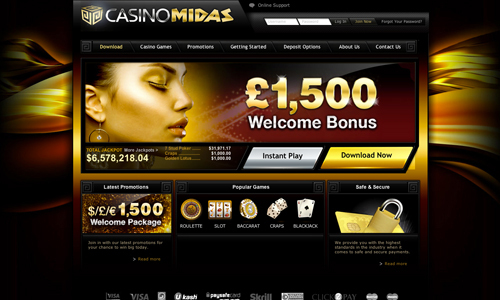 Realtime Gaming casinos are best known for their slot machines and in this respect Casino Midas does not disappoint. 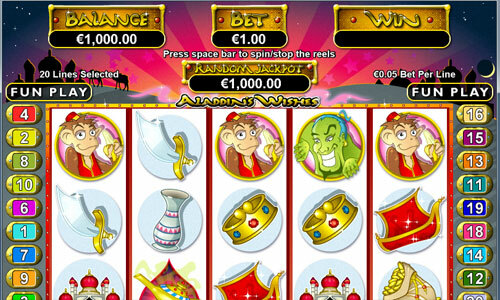 There are well over 100 different video slots for you to try your luck at, and most of them are connected to local random jackpots that increase as you play. This means that you can randomly win a small jackpot on any spin, irrespective of the symbols on the reels, and even if your spin is not a winner according to the game’s paytable. RTG slots tend to be medium to high variance which means that you can have some dry spells interspersed with some huge wins. In particular games like Loose Caboose, Triple Twister and T-Rex are known for their lucrative bonus features. In addition to the random jackpots on the slots, Casino Midas offers players the chance to win several large pooled progressive jackpots. These jackpots are shared between most casinos that use software from RTG, so the pot grows each day with play amongst people all across the world. The two largest jackpots at the time of writing are Jackpot Pinatas and Aztec’s Millions, and both are worth well over $1.6 million. As far as table and card games go, the casino offers the standard set of RTG games which include Blackjack, Baccarat, Caribbean Stud, Craps, Pai Gow Poker, European Roulette, and Tri Card Poker among others. Video Poker players have the choice of several machines that can be played in multi-hand modes if you prefer, and there is also a game of Keno for those of you who are into that. 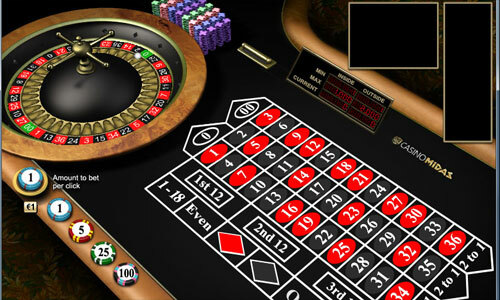 The website claims that the casino offers live dealer games, but I could not find any such games on either the Windows software or the instant play section of the website. So I opened up the instant chat line to ask where they were and was told that they don’t have any. There are other RTG casinos that do have live dealer games so hopefully that means that they are on the way. Otherwise I cannot understand why they would say that on their website as it can only lead to disappointment and annoyance. The banking options at Casino Midas are more diverse than most RTG casinos, no doubt due to the casino’s policy of not accepting American players. In addition to Visa, Mastercard, and EntroPay credit and debit cards, the casino supports e-wallets including Neteller and Skrill, Citadel bank transfers, and Ukash vouchers among others. Deposits are handled instantly while my test withdrawal was held for 48 hours before being processed (after verifying my identity with documents). Overall I waited around four days for my first withdrawal which is ok, but nothing to get excited about. One disappointing aspect of the withdrawal process is the tiny $3000 per week withdrawal limit. We are normally more forgiving when seeing this sort of thing at a casino that accepts Americans because we understand the difficulties inherent in paying people from the USA. Casino Midas has no such excuse, and it was all the more surprising to see this at a casino that is associated with other “big-name” Playtech casinos that have higher limits. Support is provided 24 hours a day, 7 days a week, and the casino can be played in a host of different languages. The support reps can be contacted via live chat, email, and telephone, and as I related above my story about the live dealer games, reps are on hand at all times of the day to answer your questions. Casino Midas is a middle of the road casino. RTG Casinos that don’t accept Americans offer nothing new to European players that are spoilt for choice by hundreds of casinos with games from top notch developers. The small weekly withdrawal limit is lower than several other RTG casinos that service Americans, which diminishes the appeal of this casino further. If you’re a non-American who loves RTG then it is worth a try, but for everyone else there are many better choices.